My quest for the best smoker pellets began on a steaming summer day. I crawled, inch by inch across the hot asphalt, a grey ghillie suit hiding my approach. Reaching up, I carefully peered inside another hopper. This was the one I had been waiting for, the 10 time local BBQ champion’s. I flipped open my notebook and quickly scribbled in the details before creeping away without a trace. Okay, so maybe we didn’t sneak up and peak into the hoppers of professional BBQ’ers. 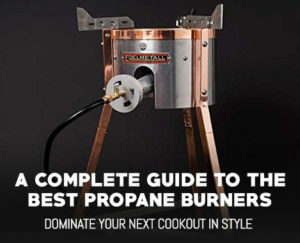 But, we did compiled the results of thousands of forum posts from top tier pellet grill owners and enthusiasts alike. During our research we found a surprising number of different pellet brands in use. However, BBQ Delight Smoking Pellets were the clear cut winner time and time again. Which Smoker Pellets do the Pros Use? The BBQ masters over at the Pellet Smoking forums and the Smoking Meat forums seriously know their stuff. We are talking pages of discussion on ash buildup, pellet composition, oil flavors and burn rates. There is simply no better place when it comes to pellet grill research. For a quick overview of what smoker pellets they recommend, we’ve put together the below graph. The vast majority of experienced smokers choose BBQ Delight Smoking Pellets over any other brand. In particular, they prefer the following flavored pellets. 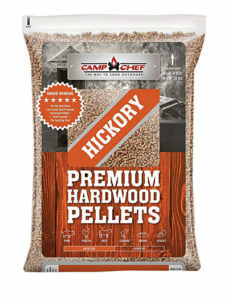 Another highly recommended option are the Lumberjack Grilling Wood Pellets. Not only are they packed full of flavor, they are also very budget friendly. Similar to the BBQ Delight Pellets, they are available in a ton of different varieties for all your smoking needs. The final two contenders were Cookin’ Pellets and Bear Mountain Smoking Pellets. Both offer superior smoke flavoring, minimal ash buildup and come very well reviewed. However, we did find the Bear Mountain pellets a bit difficult to buy online. Does it really matter which smoking pellets you choose? So, we’ve now discovered what pellets true grill masters use. The question is, why do they prefer them and does it really matter which smoking pellet you choose? The answer this fully, we first have to explore exactly what a smoking pellet is. If you’re looking for a short answer, it’s yes. At their most basic level, pellets are simply compressed wood capsules. Think of a them in terms of fuel for a car. Gas has different brands, octane ratings and prices. While they all work, some are definitely better than others. Similarly, wood pellets can be organized into three distinct categories. Premium flavored pellets are the Rolls Royce’s of competition cooking. They are high priced, extremely flavorful and produce a very minimal amount of ash. Due to their 100% flavor wood composition they also have zero filler wood and are generally an excellent choice. 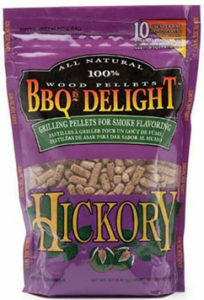 High end cooking pellets, such as BBQ Delight, offer that same flavor wood taste at a more affordable price point. You’ll also find that similar to their premium counterparts, they offer high efficiency and great burn rates. If you can, avoid standard pellets. These are made for wood stoves and use imitation flavors. While it’s possible to use them in a pellet grill. They can be packed full of non-food grade oils and potential harmful additives for enhanced BTU’s. Additionally, flavored oils are used as a substitute for flavor wood and don’t come close to providing the same taste. While some brands are clearly better than others, they won’t always have the same wood choices. The flavor profile of a pellet greatly changes depending on the type of wood selected. From sweet and musky Alders to earthy Mesquites, the correct choice of wood gives your BBQ a unique mouthwatering taste. We’ve gone ahead and compiled the below table showing all available flavors for the top three choices. It’s quickly apparent that the BBQ Delight Smoking Pellets offer the largest selection of flavors on the market. However, both Lumberjack and Cookin’ Pellets offer multiple blended varieties for a truly distinct flavor. If you’re a bit strapped for cash, you can always buy a few sample bags and mix them yourself. Another option is to use a pellet grill such as the REC TEC RT-680 which includes dual hoppers and does the mixing for you. 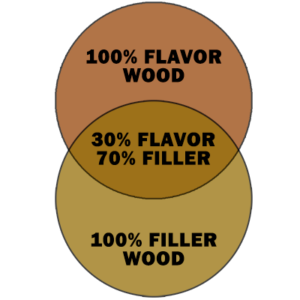 Overall, choosing the right flavor wood is critical to getting the most out of your wood pellets. If you’re unsure as to which is best, go with Apple, Hickory or Mesquite for your first couple of bags. When testing various smoking pellets, experienced users have noted the following items of interest. While these statements may seem fairly mundane, some can have a big impact on pellet performance. If you look at a lot of lower quality pellets you’ll find they tend to have issues with the above items. To check for pellet compactness, simply look for a lot of dust on the bottom of your pellet bag. While there should be a little, massive piles of the stuff indicate the pellets were either shipped incorrectly or were not compacted enough when made. Testing for bark content can only be done by actually running some pellets though the auger. Once burned, there should be very little residual materal left, if you notice piles of ash after only a limited burn time, it might be worthwhile to change pellet brands. Oil is the one factor that is basically impossible to control. The good new is, a trace of oil won’t affect the flavor or taste of your BBQ. If you’re using a reputable brand, you can rest assured that the oil is safe to cook with and designed accordingly. Look for smoking pellets that are compact, include minimal bark and have only the slightest traces of oil. Pellets like this will give you the best results and will allow your smoker to work better and reduce cleanup. So that’s it, you’re now an expert on everything wood pellet related. Well almost, the next step of course is to pick up a bag and get smoking! You should already have an idea of what sort of pellet you’re after, but if not, hopefully these reviews will arm you with enough information to pull the trigger. This section offers a detailed look at each of our top choices. We’ll cover company history, success stories as well as a few tips and tricks we’ve picked up along the way. 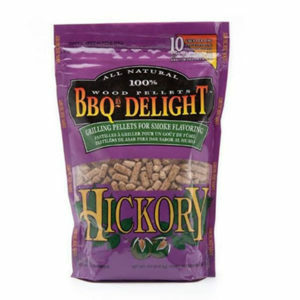 From classic Hickory to exotic Lemon wood, BBQ Delight smoker pellets are top of their class. Based on our research, they are the #1 recommended option from both pros and enthusiasts alike. If you’re looking for an outstanding all around pellet, these are simply the best choice out there. These compact pellets offer incredible heat output, while the 13 flavor wood options provide unique, bold tastes for your weekend BBQ’s. You’ll also find that with over a decade of history behind them, BBQrs Delight is one of the best known names in the industry. With multiple top finishes in local and regional BBQ competitions, you can’t deny the effectiveness of them either. 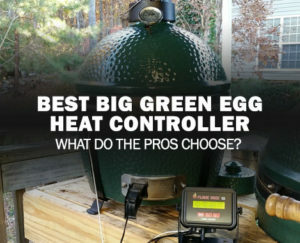 Online forums are packed full of dedicated grill masters who swear by these having tried nearly all the other brands out there. In summary, you’ll be hard pressed to find anything better in regards to price, flavor and performance. While 20 or 40 lb. 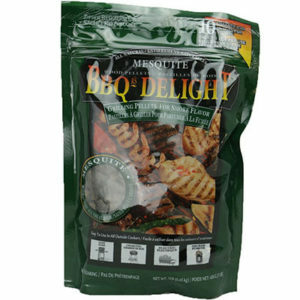 bags of Hickory, Apple and Mesquite are classic choices , BBQer Delight also offers 1 lb sample packs so you can test out different flavors in a very budget friendly manner. This is rather unique and really helps out novice and expert BBQ’ers explore the various flavors without buying in bulk. Just as a mighty lumberjack can win over the ladies, these pellets can do the same for your taste buds. As high quality wood pellets go, Lumberjack BBQ Grilling Pellets consistently rank among the best out there. Straight of the bat they have an impressive 10 flavors. Five are blended varieties while the other half offers 100% flavor wood goodness. Lumberjack pellets were the second most recommended option and have a ton of happy customers. 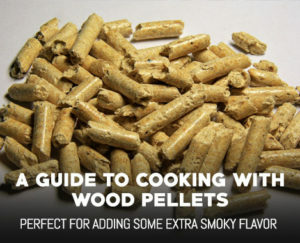 Professionals noted that these wood pellets tend to burn hotter than their counterparts. This allows for the versatility of smoking or grilling at a moments notice. One of the areas in which these pellets got high praise was for their clean smoke flavor. Low quality pellets tend to burn with a lot of soot and ash which can impact the flavor of your food. The Lumberjack BBQ Grilling Pellets have very minimal ash build up and produce wonderful, full bodied flavors with minimal effort. Some users have pushed these pellets to the max and used them with pizza oven to make a smokey pizza that is out of this world. I mean, honestly, who wouldn’t like something as delicious as an apple wood smoke pizza topped with melted cheese and meats? You’ll find that at a bit over a $1/lb. these are not the cheapest pellets out there. As with most things, if you want quality, you’ll have to pay a premium. What we can tell you though, is the Lumberjack Grilling Pellets are totally worth is and give you a thousand reasons to get out and enjoy your outdoor kitchen. As a staple in many pellet grill hoppers, Cookin Pellets are one of the premier 100% flavor wood smoker pellet options available. With a storied 12 year history and an incredible well reviewed product, these are some of the best on the market. Users consistently rave about the powerful flavors and low cost bulk bags. You will however, have limited flavors to choose from when compared to BBQer’s Delight. We’ve also come to the conclusion that these pellets produce slightly more ash then our #1 choice. While not a deal breaker, it is something to be aware of. Even if you use something like the Traeger Pro Series 34 multiple times a week, a 40 pound bag of pellets should easily last you over a month. We’d recommend you give the Cookin Pellets Perfect Mix a try before diving off into their other flavors. It can consistently produce mouthwatering BBQ with no mixing, no mess and no headaches. The perfect mix is a special blend of Hickory, Cherry, Apple and Hard Maple that makes for heavenly brisket, chicken, ribs and more. Mixed blends also tend to allow for complex infused flavors that are much more subtle then a single overpowering taste. Overall, these make for excellent cost effective smoker pellets and work in nearly every pellet grill imaginable. As you have no doubt found out, there are a million different pellet manufactures on the market. And believe it or not, most are actually quite good. While they may not be the pro’s choice, there are a few more we wanted to give a quick shout out to. One common question we’ve seen is “Do I need to use Traeger Pellets with a Traeger Pellet Grill?” Traeger, for some odd reason has stated the warranty on their device will be voided if any other pellets are use. This is totally false and in face we’d recommend you NOT use Traeger pellets and instead opt for one of our top choices. Traeger branded smoking pellets burn poorly, leave a ton of ash and are frankly not that flavorful. So What Smoking Pellets Should You Buy? The time’s come to finally click the buy button. You’re mind is made up and your ready to go. But then you think about that one other flavor and your resolve falters. Is this really the right one to buy? Do I need a bigger bag? Well stop it! 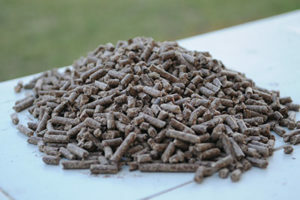 You’ve done the research and if you’ve made it this far into the post you’re about as educated as you can be without actually testing out individual wood pellet brands yourself. If it were up to us, we’d recommend going with a 20 Pound Bag of Apple Flavor BBQR’s Delight Smoking BBQ Pellets. This will give you reliably consistent results that taste amazing. While they aren’t the cheapest option out there, you’ll save a lot of money instead of going back and forth between inferior wood smoker pellets. Now, get outside and fire up that BBQ!